Section 1 Forming an SFGA? Small farmer groups can increase their economies-of-scale and bargaining power by joining with other groups engaged in similar activities. These inter-group associations are important fora where small farmers can acquire new skills in the management of larger organizations. They can also serve as useful development vehicles, not only helping farmers solve their own problems but making it easier for governments to assist them in their efforts. 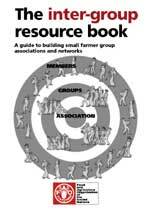 This resource book shows how, using a participatory approach, inter-group associations can be established and run by groups in rural areas. It is intended for use by Group Promoters (GPs) or Inter-Group Promoters (IGPs), extension workers and other rural development staff to help existing groups set up and run such inter-group enterprises. Formation of groups themselves is covered in The group promoter’s resource book, while development of group enterprises is described in The group enterprise resource book – both also available from FAO.